SCOTUS will hear arguments today in an Alabama capital punishment (Wood v Allen) case involving Atkins issues. The Wood challenge is based on the argument that his defense counsel failed to investigation and develop evidence for the penalty phase of his trial based on evidence of mental retardation. 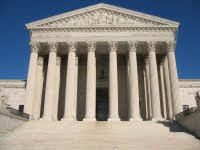 A preview of the SCOTUS argument can be found at the ACSblog. Additional information can be found at the SCOTUS WIKI. Will provide updates as I can.